Present state: Demolished - the site has been re-developed with industrial units. Part of the original boundary wall survives. A blocked arch in the wall might have been an entrance to the original station. Bacup station is located in the Rossendale Valley. Rossendale is the deep, narrow valley of the River Irwell in the Lancashire Pennines. It is also a borough whose administrative centre is Rawtenstall which also includes the upper valley of the River Spodden and adjacent tracts of moorland. Encouraged by the construction of the Haslingden to Bacup turnpike road in 1826-28 the five miles between Bacup and Rawtenstall, along the headwaters of the River Irwell, became packed with terraced housing and mills, wherever the valley was wide enough or the slopes gentle enough to accommodate them. Because of the west-to-east alignment and steep slopes, the valley floor of Rossendale is permanently in shadow in late autumn and winter, and this is particularly noticeable in the gorge at Thrutch (or the Glen), where there was no space for housing and industry. As elsewhere in the Lancashire Pennines, textile mills lined the swift-flowing river, but Rossendale developed a distinctive industrial economy with woollen as well as cotton mills, and a particular speciality in manufacturing felt and (from the 1870s) carpet slippers. 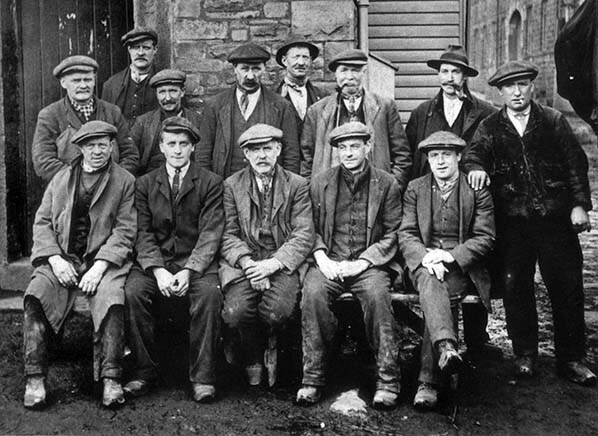 Centred at Waterfoot and Newchurch the slipper industry was an offshoot of wool and felt manufacture, and of the custom of millworkers to wrap waste felt around their clogs. To this day the footwear outlets in Rossendale are reminders of slipper manufacture which, like so much of the Lancashire textile industry, has largely moved overseas where labour is cheaper. In the 1840s the expanding industry and population of Rossendale promised to reward any railway company that could serve this valley, and once the railway from Bury and Rawtenstall reached Bacup in 1852 it enabled the local economy to prosper well into the twentieth century. According to the historic Bacup Times website in 1881 there were 67 cotton and woollen mills in Bacup as well as seven size works and four print works, four dye houses and five reed and heald works, three felt works, two corn mills, two breweries, three iron foundries, 61 workshops, 19 stone quarries and 16 coal mines. (The reed and heald works made equipment for the separation of the weft thread on cloth-weaving looms.) It was in December of 1881 that a second railway reached Bacup and used the station which had just been rebuilt to handle the increasing traffic. This line was from Rochdale, and it followed the valley of the River Spodden (or the Whitworth Valley) – like the Irwell Valley, deep and narrow, with almost continuous development of Victorian terraces interspersed with mills and nonconformist chapels. The railway made its way through the townships of Whitworth and Facit, before breasting the watershed at Britannia to descend into Bacup. No further railway development took place at Bacup, other than the ‘Bacup Light railway’ to Facit, which was, in fact, a street tramway. Communication northward to Burnley and eastward to Todmorden would continue to require a road journey, in which (as eloquently expressed in Bacup Jubilee Souvenir Handbook 1932) ‘it is necessary to traverse moors of considerable altitude’. These moorland roads rise to above 1,300ft ‘ower t’tops’ – as local people refer to the ascent over the moorlands – and any railway attempting link Bacup with Burnley or Todmorden would have required lengthy tunnels or formidable gradients. Nevertheless, plans have been seen of a proposed railway between Bacup and Burnley via Weir – of which details would be gratefully received. As it was, the ‘Facit Branch’ to Bacup from Rochdale avoided a lengthy tunnel by virtue of punishing gradients of up to 1 in 34 to reach the 967ft summit at Britannia, about 1½ miles from Bacup, and only two short tunnels were needed – near Bacup (144yd) called the Britannia or New Line Tunnel , and under Whitworth Road (43yd) between Wardleworth and Shawclough & Healey stations. The terminus at Bacup was at an altitude of 801ft, in what is Lancashire’s highest town. The name (locally pronounced ‘Bare-cup’) is of Old English origin and means ‘valley by a ridge’. This terminus station in the town of Bacup opened on 1 October 1852. It was at the end of the East Lancashire Railway (ELR) line from Clifton Junction through Bury and Rawtenstall. The route had opened in stages, the first section from Clifton Junction to Rawtenstall opening to passengers on 28 September 1846. The next section, to Waterfoot, opened to passengers as a single-track line on 27 March 1848. However between Waterfoot and Bacup there was a formidable natural obstacle called Thrutch Gorge, better known today as the Glen. Tunnelling was required at this location, and it was another four years before passenger trains were extended from Waterfoot through to Bacup: this took place on 1 October 1852. At the time of opening Bacup station had only a single platform, but goods facilities were provided. It was served by trains to and from Manchester via Clifton Junction. An engine shed stood immediately east of the passenger station. On 13 May 1859 the Lancashire & Yorkshire Railway (LYR) absorbed the ELR. During the early years of LYR ownership passenger train services from Bacup continued to run to Manchester via Clifton Junction. Bradshaw’s timetable for February 1863 is shown below. Although trains are shown as operating to or from Manchester (New Bailey Street) – that is to say, Salford – most times between Ramsbottom and Manchester are identical to those shown in another table for trains to or from Accrington, so a change at Ramsbottom or Bury was probably needed. From 1 September 1879 services to and from Manchester were transferred south of Bury from the route via Clifton Junction to a new line via Prestwich. Traffic had increased to such a level that doubling of the line from Rawtenstall to Bacup had been authorised: the line from Stubbins to Rawtenstall had been doubled in 1857. Authorisation had been given on 24 July 1876, but it was a challenging task as it was necessary to excavate an extra tunnel (Newchurch No.3)parallel to the two existing short tunnels (Newchurch Nos.1 and 2). Bacup station’s single platform was dealing with almost 30 passenger trains per day, and a decision was made that the station should be rebuilt to cope with increased traffic - and the promise of yet more when the Rochdale to Facit branch was extended to the town. The long, narrow site posed a problem for expanding the passenger station, and space was released by removing the existing engine shed and building a replacement a short way up the newly extended Facit Branch. Rebuilding work began in 1880, for which £6,000 was allocated. The new station facilities were ready for public use from 27 March 1881, although the double-track line had been operational since 17 March. On 1 December 1881 trains first arrived from Rochdale, resulting in Bacup station having an unusual arrangement of being the terminus of two branches. The Rochdale line continued to be known as the Facit Branch even when it had been extended to Bacup. The new facilities at Bacup consisted of a wide island platform with a track on either side, each with an engine-releasing loop. A single-storey brick building containing the booking hall and a lamp room stood at the north end of the station, facing onto Rockliffe (now Rockcliffe) Road; an awning was provided on the frontage. A substantial awning extended about two-thirds of the length of the platform and two waiting room blocks, one of which contained two rooms, were installed beneath it. Goods facilities of the redeveloped station comprised sidings, a large goods shed and a 10-ton crane behind India Mill to the south of the station with further sidings and the cattle pen to the east on the site of the original engine shed. The station signal box was constructed in 1892 to an LYR design, with a 49-lever frame. 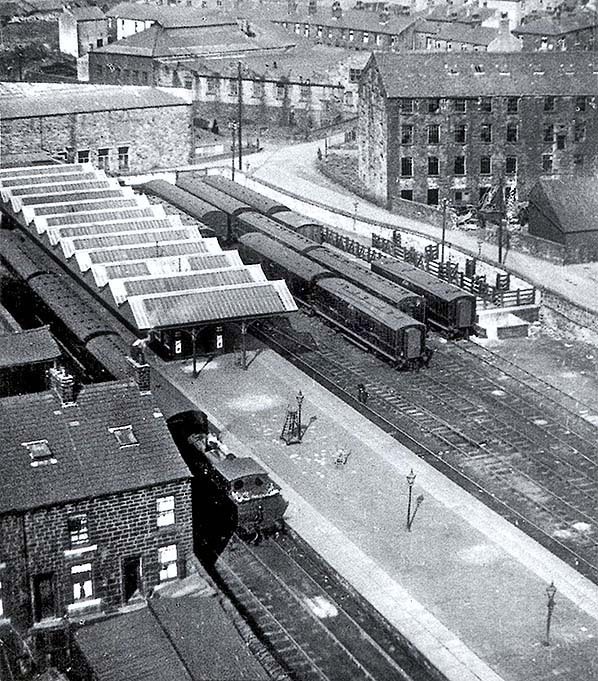 The engine shed at Bacup opened in 1882, replacing existing ones at Bacup, Facit and Ramsbottom, and it was intended to service both branches to the town. Construction of the shed was delayed because of the instability of the ground, and it opened a year later than intended. It was located on the Facit Branch about ¼-mile south-east of Bacup station; its position was north-east of the running lines and it was approached from the Britannia and Rochdale direction. A 50ft-diameter hand-operated turntable was installed. The engine shed had four through roads with workshops and offices along the south side and was equipped with a combined water tank and coaling stage. Close to the siding ‘throat’ was a residence (on a 1960 map named ‘Height Barn House’) probably provided for the shed foreman and his family. Throughout its life the shed was little altered although the LMS replaced the roof in the early 1930s. The shed was known as 26E by the London, Midland & Scottish Railway. A short distance south-east of the shed was the 144yd New Line (or Bacup, or Britannia) Tunnel. The late Eric Mason, celebrated chronicler of the latter-day independent L&Y in his writings, mentions Bacup loco shed in the book My life with locomotives (Ian Allan, 1962), which he wrote under the pen name ‘Rivington’. After his apprenticeship at Horwich works and spells on the loco maintenance and operating sides at running sheds, he was appointed in 1919 for a six-month spell as a junior inspector. One of his duties was to visit running sheds to investigate locomotive failures and mishaps and derailments in running shed yards. He comments on the inaccessibility of some of the sheds he had to visit, because of their distance from the nearest station, referring particularly to Wakefield and Goole. He then concludes, ‘Finally, Bacup shed, situated as it was about a mile along the Bacup-Rochdale branch, was a poor place to visit in bad weather as there was not even a tree trunk or a blade of grass to afford any protection from the elements’. The signal box, on the down side close to the shed just south-east of Bacup, opened in 1881/82 and was a Railway Signal Co brick-based structure equipped with a 20-lever Stevens frame. In its early days the box was apparently known as ‘Britannia Engine Shed’ – presumably the shed was known by this name too – but by the early 1890s the box was named ‘Bacup Engine Shed’. The signal box was replaced by the LMS in 1925 with one of a former LNWR Type 5 design on an adjacent site. Ironically, in 1965 – long after the shed and the signal box had closed – the local council was discussing possible industrial redevelopment of the site of ‘Britannia engine sheds’ (old name, and plural: Bacup Times 20 October 1965). Trains to Manchester Victoria, as in the August 1887 timetable (above), travelled via the Irwell Valley, then between Bury Bolton Street and Manchester Victoria via Prestwich. However these Irwell Valley line services were diverted after 1916 to run via Heywood and Middleton Junction because the line from Manchester Victoria to Bury had been electrified. Passengers from Bacup and other stations on the line tended to change at Bury to the electric service. After a few years many Bacup line trains terminated at Bury. By the 1870s horse-buses operated between Bacup and both Bury and Rochdale, one of the providers being the Rossendale Division Carriage Co Ltd. An early service which provided six trips per day ran between the Spread Eagle Hotel in Rochdale and Bacup and operated until 1906. Competition with the Irwell Valley railway route intensified when the Bacup Tramway to Rawtenstall was constructed along the main road; it opened in 1889 and was steam-operated. Five years earlier the Bury, Rochdale & Oldham Tramway Co had opened a route along the main road from Rochdale to Facit, competing with much of the length of the parallel railway. Competition from street tramways became yet more effective shortly before World War I when in 1909 Bacup Corporation bought the Irwell Valley tramway from the Rossendale Valleys Tramway Co, electrified it and leased it to Rawtenstall Corporation. Then in 1911 the ‘Bacup Light Railway’ was built, extending the existing Rochdale-Facit tramway along the main road through Shawforth and Britannia to Bacup. From the start this line was electrified. In an attempt to compete with the trams the LYR introduced a rail-motor on the Facit Branch in 1906, but it is understood that it struggled on the steep gradients and was swiftly withdrawn. It took approximately 32 to 34 minutes to travel by train from Bacup to Bury, and a minute or two was added for journeys in the opposite direction to compensate for the gradients. The July 1922 timetable, below, includes a number of short workings to Rawtenstall, Ewood Bridge & Edenfield or Ramsbottom: these are one class only ‘motor trains’. Rochdale line services were always less frequent than those through the Irwell Valley. Close to Bacup engine shed was a private siding that served Greenwood’s Rockcliffe Vale Steam Mill. This was a corn mill, and it was rail-served following an Agreement with the LYR made on 14 September 1882. In April 1907 work began on the Ross Spinning Company’s cotton mill on a nearby site. An Agreement was made with the LYR on 11 March 1913 for a siding, which passed alongside Greenwood’s mill. At some date between 1910 and 1930 Greenwood’s mill was closed and demolished, but Ross’s mill survived until the 1960s when it, too, was closed and demolished; Ross’s siding was removed before 1958. In 1922 the LYR was absorbed into the London North Western Railway (LNWR) and from 1 January 1923 that company became part of the London Midland & Scottish Railway (LMS). In 1925 the LMS replaced Bacup Engine Shed signal box with one of LNW design. The LMS timetable for the summer of 1932 shows 39 departures from Bacup on weekdays, 12 of them to Rochdale with the rest heading to destinations along the Bury line including Manchester Victoria, Bury Bolton Street, Bury Knowsley Street, Rawtenstall and even Ewood Bridge & Edenfield. This was the year in which Bacup’s street tramways to Rochdale and Rawtenstall were abandoned and double-decker ‘motor omnibuses’ replaced them. Motor buses had first connected Rochdale and Bacup in 1926. According to Bacup Times (26 April 1947) the line from the town to Rochdale enjoyed its greatest popularity ‘in most recent times, in 1930’ when Bacup people took advantage of cheap return fares between the town and Wardleworth: this was the last stop before Rochdale station, and more convenient for the town centre. A later edition of the paper (21 June 1947) recollects that the return fare to Wardleworth was only 9d (as against 7d single). However, after the war the return fare had risen to 2s 3d. This is likely to have encouraged potential passengers from Bacup and intermediate points to patronise the buses instead. Officially because of the ‘coal crisis’ the LMS suspended the passenger service on the Facit Branch on 16 June 1947 and it was never restored. In the two months between the announcement by the LMS of the intention to suspend the service and the final train, it is notable that the only two letters published in Bacup Times about the matter were both from Mr B Butterworth, encouraging others to complain; he was Branch Secretary of ASLEF (the drivers’ and firemen’s union)! The last train to arrive at Bacup from Rochdale decanted 18 passengers, and ‘no more than three’ clambered aboard for the final trip to Rochdale (Bacup Times 21 June 1947). Whitworth Town Council was keen to challenge the closure, but their colleagues in Bacup seemed content to bow to the inevitable. On 1 January 1948 Bacup became part of the nationalised British Railways (London Midland Region) (BR[LM]). In December 1949 BR announced the decision not to restore the Facit Branch passenger service, and the line from Facit to Bacup engine shed closed to all traffic on 5 May 1952, although the tracks were left in place until 1964 for the storage of wagons, should the need arise. In its latter years Facit-Bacup was used for ‘light engine’ movement (engines drawing no wagons or coaches) to and from Bacup engine shed. Goods traffic from Bacup was generally worked via the Irwell Valley because of the exceptionally steep gradient up to Britannia on the Facit Branch. After closure between Facit and Bacup, for the short time that Bacup shed remained open, light engines worked via the Irwell Valley. The demise of passenger services between Rochdale and Bacup brought about a reduction in the shed’s locomotive allocation, and with only eight locos in residence it closed on 10 October 1954. Seven locos were transferred to Bury and one was withdrawn. In 1954 the line between Bury and Bacup was considered busy enough to warrant the introduction of modern rolling stock, and it was reported in the local press that new diesel multiple units (DMUs) were to be introduced; they entered service on the line on 6 February 1956. Bacup had 35 daily departures, giving a half-hourly service: the most intensive that the line would see. On Sunday 11 January 1959 a serious fire broke out in the goods warehouse at Bacup station and it was completely destroyed, but goods traffic continued to be handled in the yard. During the time that the Facit-Bacup line was in its comatose state, the area between Britannia and Bacup shed was used in a short sequence of the film Whistle Down the Wind of 1961, directed by Bryan Forbes: the film was largely made in the village of Downham at the foot of Pendle Hill, about 15 miles to the north, but the railway sequence used the cutting east of the Newline Tunnel at Bacup shed and is followed by a shot in which the derelict Bacup Engine Shed signal box appears. The purpose of The Reshaping of British Railways (‘Beeching Report’) of March 1963 was to reduce the financial losses of the national railway network, involving the closure of many loss-making passenger lines and stations. The report’s proposals for Lancashire and north Manchester were astonishing in their severity. The entire route from Manchester via Bury Bolton Street to Accrington and the branch to Bacup were earmarked for closure, yet the nearby Manchester – Oldham – Rochdale and the Bolton – Bury Knowsley Street – Rochdale lines were not. Bacup Times (30 March 1963) was incensed, claiming that the ‘Beeching bombshell’ could have exploded nowhere more devastatingly than Rossendale, removing its last link to the national railway network, and probably deterring industrialists from expanding in the district. The matter was confused by a statement concerning the future of freight traffic by the North Western Line manager, in a press conference on the day of the Report’s publication: ‘We will close a large number of small depots and probably close routes, but we do not intend to give up any possible freight business at all’. Another fire caused damage at Bacup station; this time, on 6 August 1963, the signal box was ablaze. It is assumed that emergency temporary measures were instated to operate the line, for which authority was given on 18 March 1964 to operate as a single track as far as Stacksteads. Bacup Station Junction box officially closed on 26 April 1964. The station ground frame installed after the fire of August 1963 – to control access to the goods yard and released by Stacksteads signal box – remained in use until the line closed. On 30 October 1964 formal notice was given of the intention to close (as announced in Hansard) Manchester Victoria – Bury – Bacup including Rochdale – Bacup as well as Manchester Victoria – Bury – Accrington. Only three days later the Bacup branch was closed to goods traffic, except for the coal depot at Bacup which operated until 2 May 1966.The absurdity of withdrawing passenger services on the heavily used, electrified service between Manchester and Bury was acknowledged when, on 8 February 1965 Tom Fraser, the Minister of Transport, refused consent to closure. However on 14 September 1966 his successor, Barbara Castle, consented to the withdrawal of Bury – Accrington trains and the service between Rawtenstall and Bacup, while refusing permission to close the Bury – Rawtenstall section as one of the commuter services whose discontinuation would add to road traffic congestion. Weekday train services on the Bacup branch continued to be intensive despite the threat of closure, with (in summer 1964) a basic half-hourly regular-interval frequency on Monday to Friday, and a quarter-hourly service on Saturday afternoon; the evening Monday-to-Friday service was hourly, but half-hourly on Saturday. By contrast no trains ran on Sunday. On Monday to Friday off-peak trains generally omitted one station stop at Stacksteads, Clough Fold, Ewood Bridge & Edenfield, or Stubbins, and three evening trains on Saturday omitted one stop. Several trains in the public timetable are shown to connect at Bury Bolton Street with electrics to Manchester Victoria via Radcliffe Central which provide a faster journey than by the through train from Bacup. Trains travel to Manchester Victoria via Bury Bolton Street, Bury Knowsley Street, Broadfield, Heywood and Middleton Junction. This remarkably intensive service came to an end on Saturday 3 December 1966: how many other lines with such frequent trains were to close? The formal closure date was 5 December 1966, and – goods and coal traffic having already been discontinued – all traffic on the line from Rawtenstall to Bacup ceased. On the previous Saturday, 26 November, the Manchester Rail Travel Society ran the steam-hauled ‘Three Counties Special’ which called at Bacup, and on Saturday 3 December the LCGB ‘Rossendale Forester Rail Tour’ (also steam-hauled) visited the Bacup Branch as well as the Bury-Accrington line which closed at the same time. Bright sunshine and a dusting of snow provided wonderful conditions for final-day photographs. The tracks between Rawtenstall and Bacup were lifted in October 1968. Bacup station’s platform roofing was demolished by September 1971; a photograph by John Mann shows that the platform was still intact at that time. The passenger station and engine shed sites are used by industry. Tickets from Michael Stewart . Route maps drawn by Alan Young. Totem from Richard Furness. Bradshaw Alan Young & Nick Catford. Other web sites: www.bacuptimes.co.uk, includes further history and pictures of the Bacup line. See also the Ramsbottom Model Railway Club web site which features 106 old photographs of the East Lancashire Railway and photographs of the club's excellent layout of Ramsbottom & Stubbins. Bacup Station taken from the top of a factory chimney in the early 20th Century. The layout of the station with its island platform and adjacent carriage sidings is clearly shown.The cattle dock and pens are seen on the right. from the Facit Branch. Click here for a larger version. 1912 10,560 OS map. 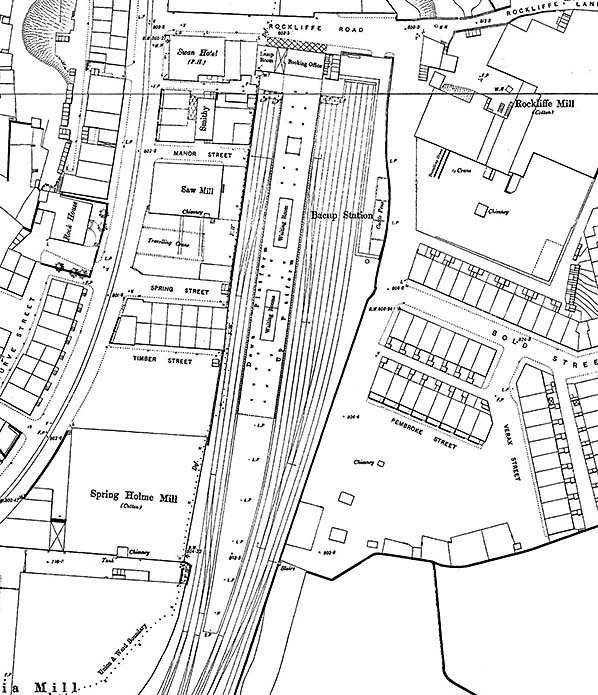 The relative positions of Bacup station and the engine shed are seen on this map: both features are named. The line to Facit and Rochdale disappears from the south-eastern corner of the map having passed through the Bacup (or Newline) Tunnel. The scale of the map is sufficiently large to indicate the expanse of sidings associated with the shed as well as the excavation that was necessary to create the near-level site alongside the 'New Line' to accommodate it in the hilly terrain. The station's goods shed and associated sidings are seen close to the passenger station and north-west of the Lancashire & Yorkshire Railway's earlier branch from Rawtenstall and Bury; this branch leaves the map having just passed through the other Bacup (or Stubbylee) Tunnel. 1930 1: 2,500 OS map. The facilities at Bacup station are basically unchanged since the map of 1892. The Ross mill now has railway sidings. Street tramways now offer competition either side of the railway: the route on Church Road (west of the station) goes to Rawtenstall while to the east along Rochdale Road the tramway serves Britannia, Shawforth, Facit, and all points to Rochdale. Of the Facit Branch stations only Shawclough & Healey is distant from this tram route. 1960 1: 2,500 OS map. The Facit Branch closed beyond Bacup engine shed in 1952 and is shown as ‘Disused Railway’. The warehouse is labelled ‘Ruin’ following the fire which seriously damaged it in January 1959, but the sidings that accompany it are still in use for handling goods. Ordnance Survey maps by this date have been given ‘security treatment’ in the Cold War era, removing detail of factories; thus the mills which were formerly named are now shown as ‘Works'. 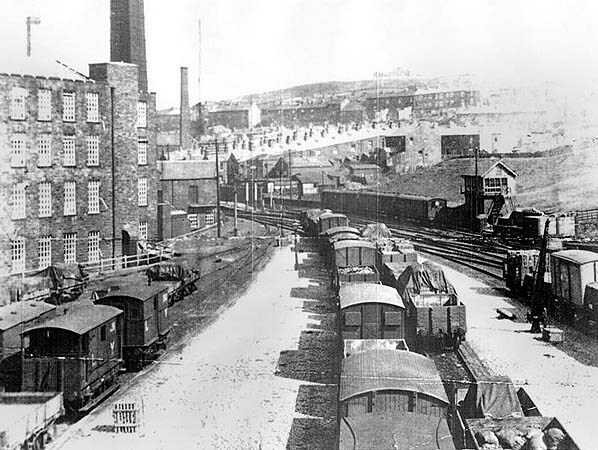 Looking north towards Bacup station from the goods yard in the early part of the twentieth century. An assortment of LYR goods waggons can be seen in the sidings. In the middle distance the south end of the Bacup station's single island platform can be seen. 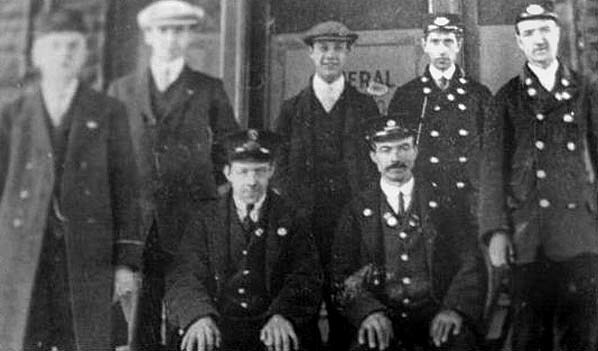 A line up of staff at Bacup station in the first decade of the 20th century.